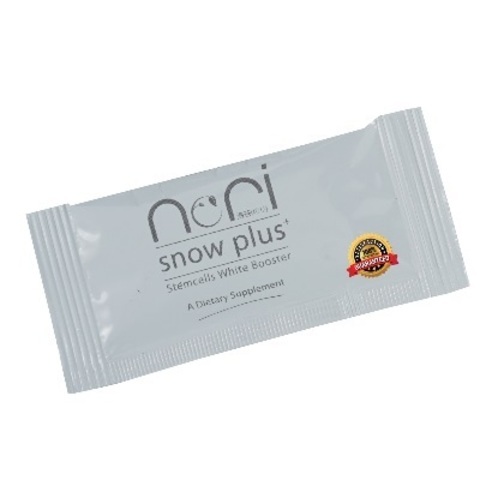 Nori Snow Plus is your secret to a healthy, firm and perfect skin. Stem cells from Uttwiler Spätlauber apple can protect skin cell regeneration and delay the onset of wrinkles, hence help to combat chronological aging. Stem cells from Gamay Teinturier Fréaux grape has high content of polyphenols for UV protection, reliably protects epidermal stem cells from UV stress. Tremella Fuciformis (Snow Fungus) has excellent skin moisture retention effects and a better result on skin lightening when compared to similar brightening agents, hence providing you a brighter, youthful, and glowing skin complexion. PhytoCellTec Malus Domestica (Apple), PhytoCellTec Solar Vitis (Grape), Apple Powder, Ascorbic Acid, Stevia Extract, Tremella Fuciformis Extract. Take one sachet and pour directly into your mouth. Consume daily for better result.